Ringtons Caramel Wafers take us right back to our childhood. Smooth caramel and crunchy wafers smothered in real milk chocolate make these biscuits impossible to resist. The sweet and sticky bars are the perfect size for dunking in your cuppa and Ringtons caramel wafers come individually foil wrapped for freshness too! Caramel 50% (glucose syrup, sugar, sweetened condensed milk, invert sugar syrup, vegetable oil, flavour, emulsifier-soya Lecithin (E322)), milk chocolate 33% (sugar, cocoa solid (min 25%), milk solids (min 14%), vegetable fat, emulsifier-soya lecithin (E322), flavouring), wheat flour, sugar, vegetable oil, raising agent (sodium bicarbonate), salt and emulsifier-soya lecithin (E322). Contains Cow's milk, wheat gluten, soya. Wheat, Gluten, Cows Milk and Soya. Suitable for vegetarians. Mallow 38% (sugar, glucose syrup, Egg Albumen), Milk Chocolate 34% (sugar, cocoa solids (min 25%), Milk solids (min 14%), vegetable fat, emulsifier (soya lecithin E322), Flavouring), Biscuit 28% (Wheat flour (contains gluten), vegetable oil, sugar, chocolate (cocoa solids (min 25%), milk solids (min 14%)), raising agents (sodium bicarbonate and disodium diphopate (E450)). Wheat, gluten, Cows Milk, Egg and Soya. Suitable for vegetarians. 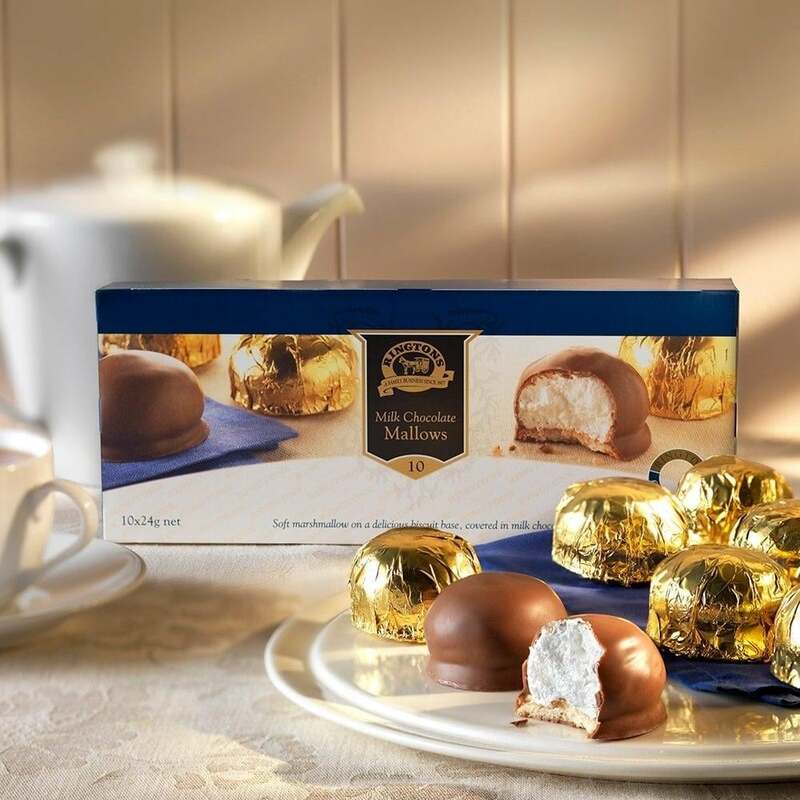 Ringtons Chocolate Mallows are one of our favourites! Soft, fluffy marshmallow covered in smooth milk chocolate, on a delicious biscuit base. Our chocolate mallows are pure, gooey goodness and all individually foil wrapped for freshness! This product has a short shelf life. Please note: Mallows are very fragile and although we pack them as securely as possible, cannot guarantee that they won't be damaged in transit. Showing 2 of our total 35 reviews, with an average rating of 5 stars. Read all 35 reviews for Ringtons Milk Chocolate Mallows. Review Summary - 5 out of 5 based on 35 ratings. Wallow in the lovely taste of these milk chocolate mallows. Good value as well. Temptation in a box !